They collect, recycle & repurpose salon or spa's hair, foils, colour-tubes, papers and plastics, glass, spa waste AND divert excess hair chemicals from being rinsed down the drain. $1 from your service each visit to Reed Hairstyling goes to paying for this recycling program. Salons produce difficult-to-manage waste often contaminated with bleach, hair color, and other chemicals. A typical salon has high water consumption, high energy usage, and releases chemical by-product down the drain. 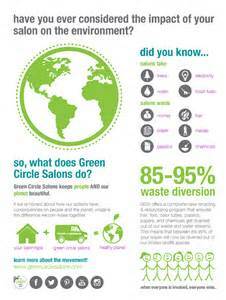 At the same time many salons strive to be eco-friendly wherever possible, to attract green-minded clients and reduce their footprint. As they create beauty, they make waste. Other materials collected are soiled foils, color tubes, aerosols, gloves, excess hair color and lightener, wax strips, nail polish bottles, glass, plastics, cardboard and paper, electronics, batteries, and light bulbs. Kevin Murphy is proudly a Gold Level Partner of Green Circle Salons.